Corporal Thomas William Robertson’s name is on the Honour Board that was unveiled by the minister, the Rev. Dr Ernest Merrington in 1916. 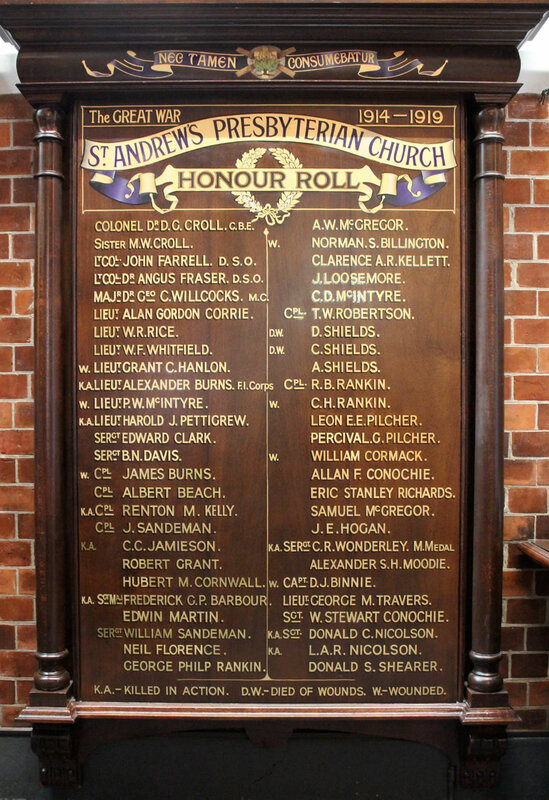 His name also appears in the minutes of a meeting of the Kirk Session of Saint Andrew’s Presbyterian Church on 1 June 1916 when he was admitted as a communicant member of the congregation. His address was recorded in the Minute Book: "N Company, NCOs School of Instruction, Fraser’s Camp, Enoggera". As a Senior Chaplain in the AIF, Colonel Merrington had probably met T. W. Robertson, then a private, on his regular visits to the army depot at Enoggera. Born in Geelong in Victoria, Thomas Robertson, a single man, working as a labourer in Southern Queensland, enlisted at Warwick to join the Australian Imperial Force on 9 March 1916, stating he was 26 years 9 months old and with no previous military experience. He gave his religious denomination as Presbyterian and named his sister Miss Margaret Robertson of Elizabeth Street, Geelong as next-of-kin. T. W. Robertson was appointed to 5th reinforcements for the 52nd Battalion for initial training. It is likely he was older than the age he stated as the only birth registered in Victoria in the 1880s for a Thomas William Robertson was in 1884. Perhaps it was on the basis of his mature age that he was chosen as a candidate for non-commissioned rank at Enoggera, even without previous experience in defence services. At this stage in the Great War, volunteers were urgently needed for service on the Western Front. His period of training before departure lasted only six months. VO1 Sergeant Robertson embarked on HMAT2 A49 Seang Choon from Brisbane on 19 September, disembarked at Plymouth, England on 19 December 1916 and took up Acting NCO duties at Number 1 Commonwealth Depot at Perham Downs. While attached to the 13th Training Battalion at Codford throughout the year 1917, Corporal Thomas Robertson was hospitalised several times. When on duty he was given responsibilities with the ranks of EDP3 Corporal or Acting Sergeant but he spent most of that year in hospital or on furlough while he was recovering from illness. Appendicitis caused his absence for several weeks and later in the year he was isolated and treated for scabies. He re-joined the 13th Training Battalion at Codford on 13 January 1918 and transferred to the 52nd Battalion at Le Havre, France in February but again illness troubled him. He was taken back to England on the hospital ship Cambria in March 1918 and admitted to Addington Park War Hospital, Croydon in Surrey where he was diagnosed with dysentery. Private Robertson4 returned to Australia on HMAT D19 Carpentaria, disembarking at Melbourne on 6 October 1918. His early discharge from the AIF was recorded as dysenteric debility and ventral hernia. He was awarded the British War Medal and the Victory Medal. Thomas Robertson’s war service was indeed an unhappy experience. Fortunately he could reside for a period of convalescence with his sister at 38 Elizabeth Street, Newtown in Geelong. In the year 1927 at Melbourne, Thomas William Robertson married Ada Clarice Clarke (1897 – 1978) of Launceston, Tasmania. They remained in Melbourne, living at 379 North Road, East Caulfield in 1931 and had moved to 100 Barker’s Road in the same suburb in 1937. Thomas Robertson’s occupation was garage proprietor. In retirement they lived in Burgess Street, Cheltenham. Thomas William Robertson died in the Caulfield Repatriation Hospital, Melbourne on 16 February 1947. His widow returned to Launceston and died there on 14 June 1978. 3. Extra Duties Pay rank meant he was paid for responsibilities as a Corporal.